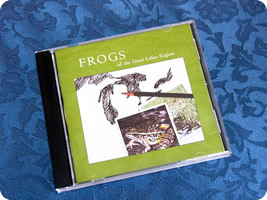 This recording provides an auditory means to identify the frogs and toads (anurans) of the Great Lakes region. Acquiring the ability to identify anurans “by ear,” when applied throughout the spring, allows for an opportunity to accurately survey their abundance and diversity on any wetland, all accomplished without ever getting your feet wet. The opening, instructional portion is a valuable tool for anyone participating in an organized frog and toad survey. Narrative is presented over a background chorus of each featured anuran in order of emergence and breeding through the season. Auditory characteristics and handles, in addition to seasonal habits and habitats are also presented. Thirteen environmental movements are arranged chronologically through the spring breeding season, and are a useful follow-up to the instruction. They also provide over 50 minutes of relaxing listening pleasure. Whether listening from your car stereo while stuck in urban traffic, or from the warmth of your den on a blustery winter night, these sounds are sure to settle you “knee deep” into the lively pulse of a spring wetland. To order, write a $18.00 check to Nature Discovery and send to 5900 N. Williamston Road, Williamston, MI, 48895. We do not accept credit cards. Allow one week for delivery. To help expedite the shipping process, contact us by phone or email when you are ready to send the check. Click on the frog's name to hear a sample of it's call!